As a society, we tend to reward problem solvers, rather than those who prevent problems at their source. In other words, we focus on after-the-fact occurrences (appraisal activities) instead of trying to eliminate these occurrences (preventing activities). Discussing and evaluating the core requirements of quality efficiency and improvement, 10 Essentials for High Performance Quality in the 21st C… entury proposes an approach to help shift the paradigm of quality from appraisal mode to preventing mode.Identifying 10 steps readers can follow to optimize the quality of products and improve customer satisfaction, the book explains the rationale behind each of the steps in separate chapters. 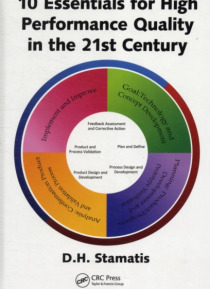 It addresses specific quality issues in six different sectors of the economy and provides statistics, tables, and figures from various organizations that support the need for a paradigm shift.Outlining a systematic process to guide your organization along the path toward improvement, the book covers risk and quality, multicultural management, empowerment, error analysis, team building, advanced quality planning, and quality operating systems. The accompanying CD provides tips and tools to help you implement all the necessary improvement initiatives under the umbrella of quality.